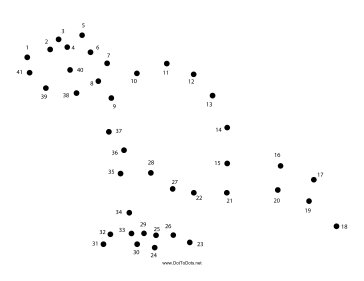 This printable dot to dot puzzle features a dinosaur with a round head and a long tail. It is fun for people who like dinosaurs. This Dot To Dot Puzzle is available to download for free, or you can download the entire collection for only $9. The free version is available in Acrobat (PDF) format: just download it, open it in Adobe Reader (or another program that can display the PDF file format) and print. The $9 version includes all of the Dot To Dot puzzles and activities from this site. It is also available as a PDF file. After purchase, you can download it and print one puzzle or the entire collection. Because of the size of the download, we recommend that you use a broadband connection (Cable or DSL) rather than a dialup connection. If you don't see a dot-to-dot puzzle or activity that you want, please take a moment to let us know what you are looking for.